A nice cold weather activity as a break from work is baking (or cooking a good dinner). Last week, inspired by a friend, I set about making homemade granola bars which are healthier and cheaper than the bought ones. They came out a bit crispy and quite crumbly but that's fine because it makes a good cereal or a topping for yogurt! I added in cranberries, chocolate chips and almonds. Next batch I'll try some different mix-ins, possibly a different recipe to see if I can get them to stay as bars. Any suggestions? That baking session also yielded banana muffins and cake. 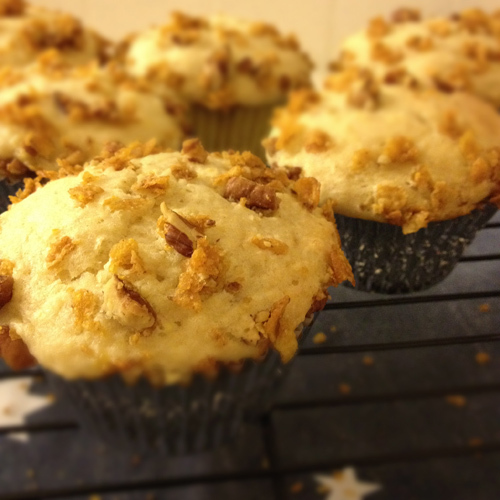 Muffins topped with pecans and cornflakes, cake included chocolate chips and lemon icing. 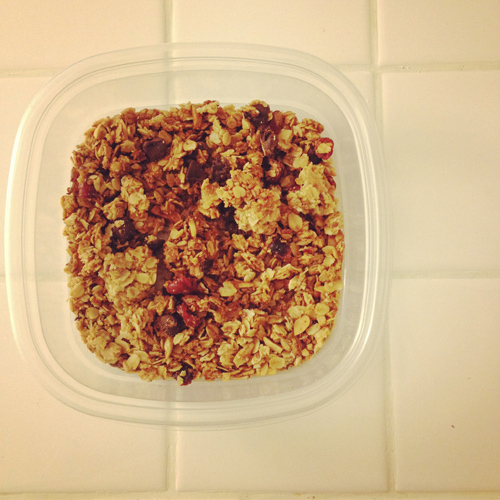 Many decades ago I made my own granola. You couldn't even buy it in Israel then. It was so good, especially straight from the oven as it got crispy. I've been making these lately (http://allrecipes.com/recipe/playgroup-granola-bars/detail.aspx) or a variation. I never have wheat germ in the house, so use flax seeds and instead of honey I use Silan. I've also added in sesame seeds. For another batch I added craisins and white chocolate chips. I made it with the raisins and didn't like it (the raisins burned). I've done other mix ins I can't remember. Just found your blog (through the Accepted loop). Fun! mine have flax seeds and coconut in it too, just for added goodness. This looks so good! I made some last week with loads of honey and coconut. I throw some on top of muffins, yogurt or as cereal. Awesome blog you have here!